Walking along the streets of Kampong Gelam - Sultangate, one cannot deny but be awed by the hustle and bustle of the district. From the delightful chatters of the tourists to the blaring of music from the shops and restaurants. All these make this once royal ground, so fascinating and unique. 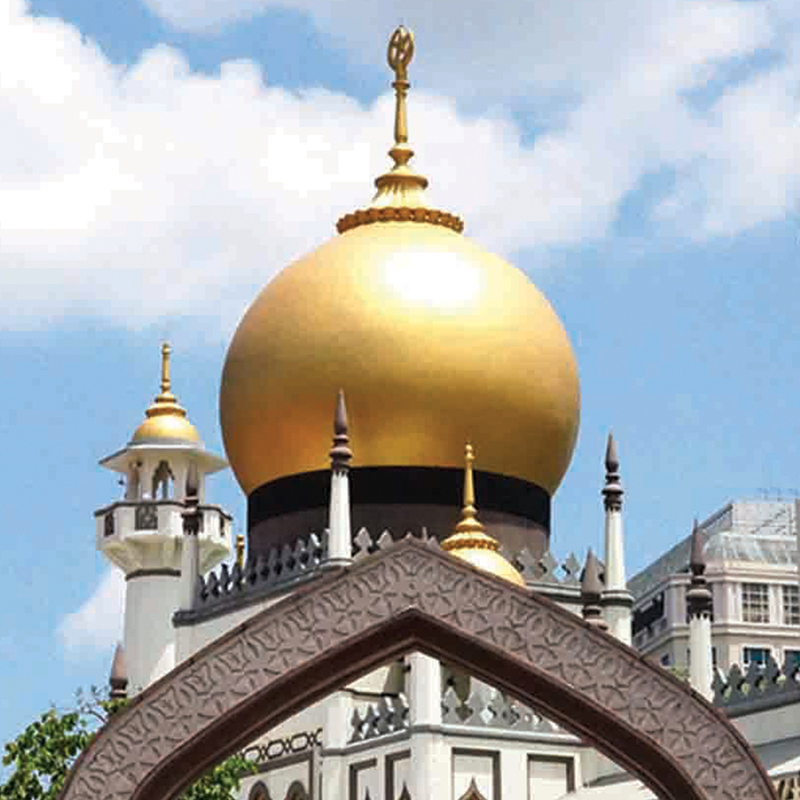 Beautiful Moorish-styled mosque, surrounded by rows of shophouses, each with its own history that spans many decades. Once a major road, Bussorah Street now has been turned into walkways for strollers and bystanders, not forgetting stretches of restaurants’ alfresco dining. This street is unlike any other places. Visit it at night and you will be transported into a scene in the tales of 1001 Arabian Nights. However, beneath all these bright lights and walls of colours, the same gratification felt by visitors hardly remained in the domain of the ‘dwellers’. 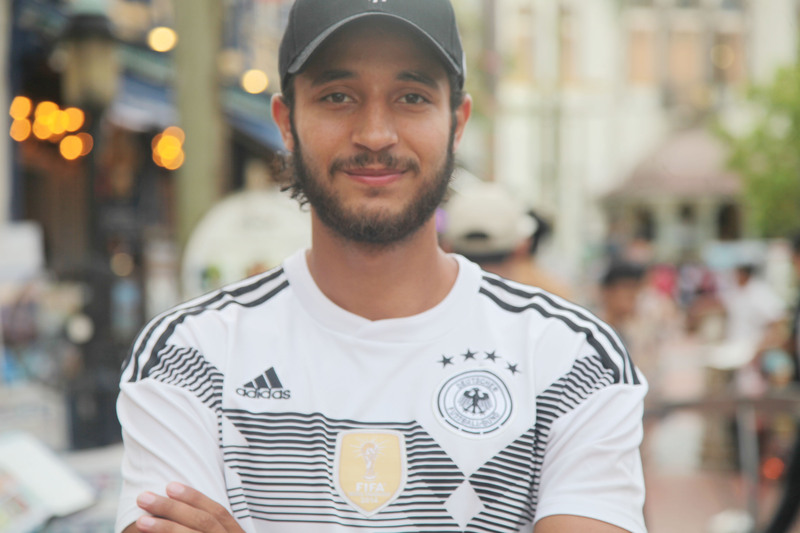 Behind those smiles that the greet passers-by, lies the strain of keeping their business afloat amidst the steep cost – mainly contributed by exorbitant rental and high manpower turnover. If not for their undying passion, these enterprising spirits may likely to die off and sink into oblivion. That is the sad, hard truth. The precinct had seen many young and ambitious lads putting their hearts and soul in their venture but eventually, only a few are able to withstand the storm. Of course, there are also others who have made it and still doing well today like I Am…Café and FIKA. On the other hand, family businesses are facing with another set of challenges. Among others, globalisation of the digital world has translated into a seamless shopping experience for customers. Thus there is an urgent need to stay relevant and keep abreast with the new technologies that have been sweeping the retail industry for the past couple of years. So how do we keep the old guard and attract the new blood ? How do balance hipsters’ choice and those of more traditional ? What can we do to ensure that Kampong Gelam does not lose its essence in this fast pace world ? I miss the old times, when most of us refer the area as Kampong Jawa, but I also wish to see the place flourish and be an iconic attraction to the rest of the world one day. One thing for sure, the Golden Dome will continue to endure the test of time and bear witness to the ever-changing landscape. It is quiet today, a lazy Thursday afternoon, but I soon realise that beneath the calm exterior of Sultan Art Village lies a buzzing arts scene full of life and artistic vision. As I walk along the streets, my eyes continually stray towards splashes of colour against otherwise monotone walls. The murals are fascinating works of art, and, even as my eyes are continually distracted by bursts of colours, I can hear the gentle tinkling of windchimes draped in front of a quaint shop, with the distant birdsong lingering around the edges of my consciousness. Walk further along, and I stumble upon some clay art pieces sitting proudly outside a gallery. Distant music floats languidly through a crack in the door, and somehow, in its own way, the musical notes complement the presence of the art pieces outside. In fact, as I soon came to realise, it complements the presence of Sultan Village as a whole. Sultan Art Village sits next to the last Istana, currently known as the Malay Heritage Centre. This is an oasis of peace. As the sunlight seeps through the palm trees, I catch a glimpse of an exquisite vision of a star bursting forth from the leaves, and I feel blessed to be able to experience that single moment of beauty. But don’t leave yet; take a soft breath before wandering along the little side streets and back alleys. Vintage items are strewn haphazardly here and there. Beside a dusty red punching bag, little gnomes line window sills, and below that sits an old record player that still holds the promise of music. Rusty bicycles line the street, and further away sits a strange metal contraption that I can’t quite decipher, but that’s okay. It is an item of mystery to be unravelled, much like the rest of this place. These scenes tell the story of Sultan Art Village; a story that suggests further secrets and greater mysteries. I am drawn into the easy rhythm of this place. Breathing once, twice, I close my eyes and simply exist in the present. In that moment, Sultan Art Village sings of freedom. My friends and I used to head over to Haji Lane after exams for much needed therapy sessions. 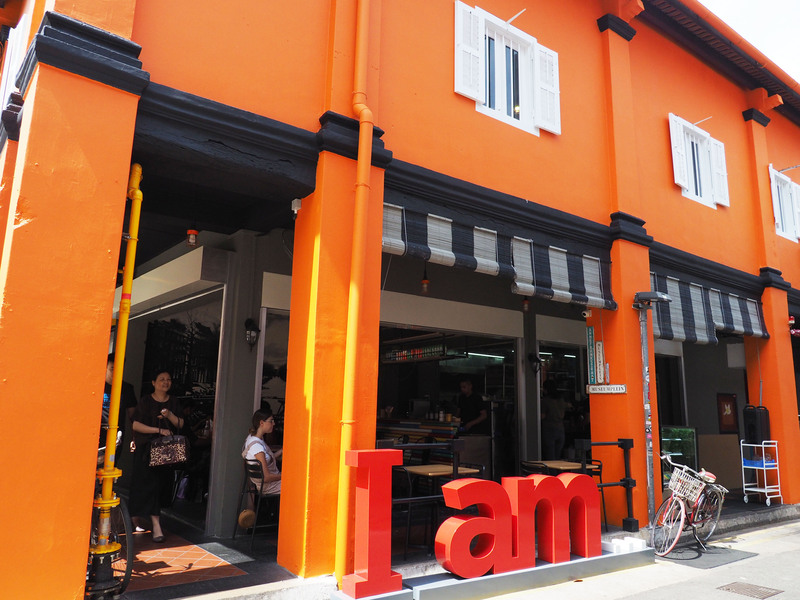 An eclectic mix of the whimsical and passionate, Haji Lane has always possessed a certain charm. As I stroll through Haji Lane, I have constantly been overcome by a sense of calmness, tranquillity, and strangely, acceptance. A sense of freedom is the lifeblood of this place. Vibrant colours co-exist alongside muted pastel shop fronts; pulsating dance beats blends in with the breezy indie music. Passers-by drift along the street, stopping whenever they fancy or to pose for insta-worthy shots against the colourful backdrop. In the 60s and 70s, the area provided lodging for poor Malay families, and gave shelter to pilgrims on their annual pilgrimage ‘haj’ to Mecca. This history of giving and hospitality is perhaps still reflected in the particularly laidback and soothing charm of this area, that has birthed a vibrant and close-knit community. One Kampong Gelam businesses gather for iftar, to break their daily Ramadan fast together. 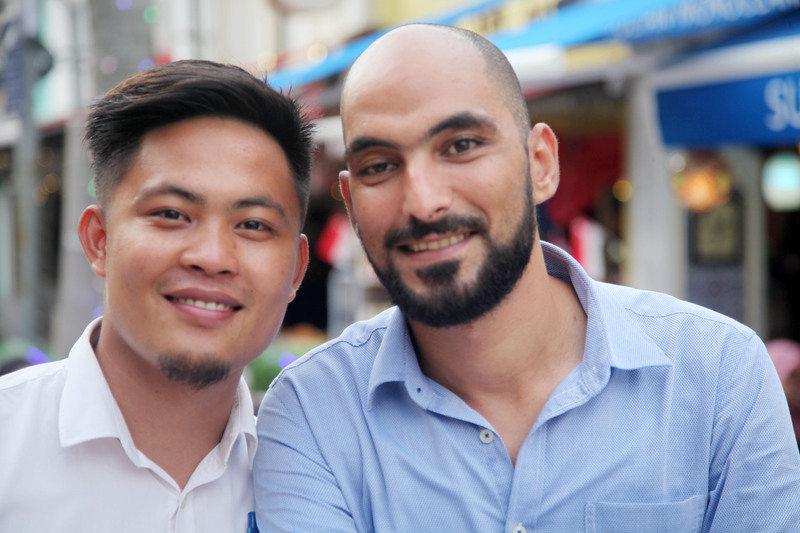 Shopkeepers greet each other with an easy familiarity, while newcomers are welcomed heartily into the family. I was talking to the team of Sultan Gate, and what really struck me was how these individuals truly believe in the power of arts, music, food, and culture to transform lives. In fact, they view these passions as a way of being, and essential to life itself. To be able to find a passion and devote yourself fully to it, is something that I personally have yet to discover. Perhaps that is why I find myself continually wandering towards Haji Lane throughout the years. For me, Haji Lane is home to the bold and the beautiful, the unique and exceptional; it is the sweet abode of those individuals who truly dare to live. And one day, I hope I will be one of them. 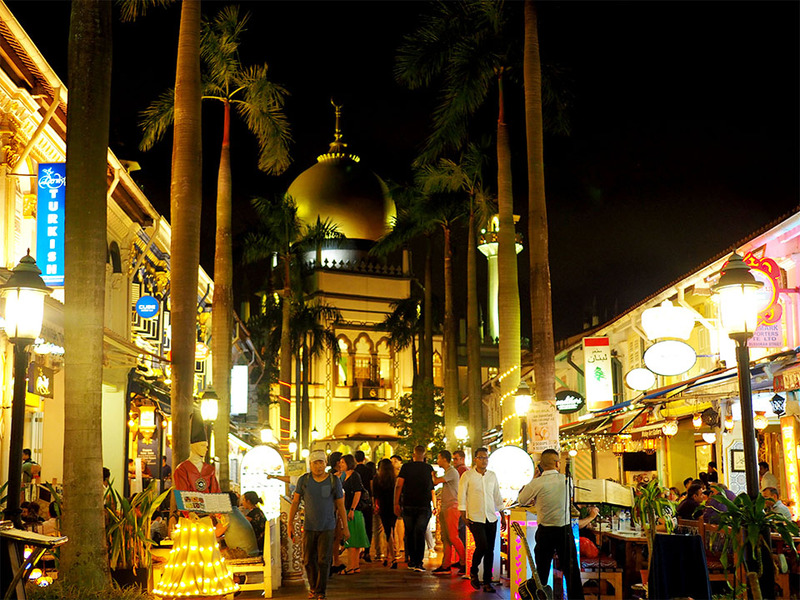 Originally called “Sultan Road”, Bussorah Street is one of the most famous streets in Kampong Gelam - SultanGate area, drawing many tourists who flock to see the noteworthy Sultan Mosque. In the past, Bussorah Street was known as Kampong Haji (Pilgrim Village), as it was where many pilgrims undertaking the haji to mecca would gather. Along and around this street, there would be many sheikh haji, pious men known for their knowledge of the haj, who would help with their preparations. Today, Bussorah Street is lined with Middle Eastern restaurants, tourist shops, and other interesting little shops (such as Lickety, Wardah Books, Konditori Bakery). 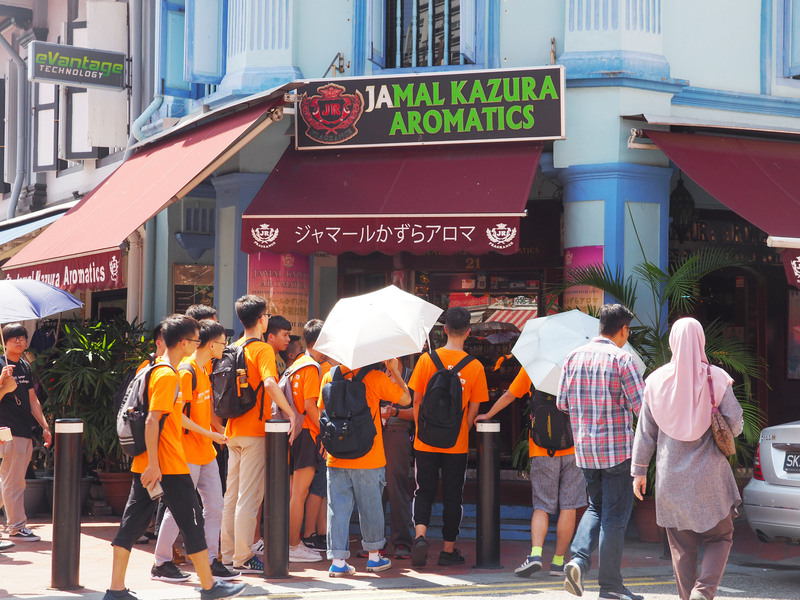 By day, it is filled with tourists keen to learn more about Malay culture. However, by night, this becomes an entirely different area. In the evening, the droning peaceful prayer calls resound through the area as muslims make their way to Sultan Mosque to pray. 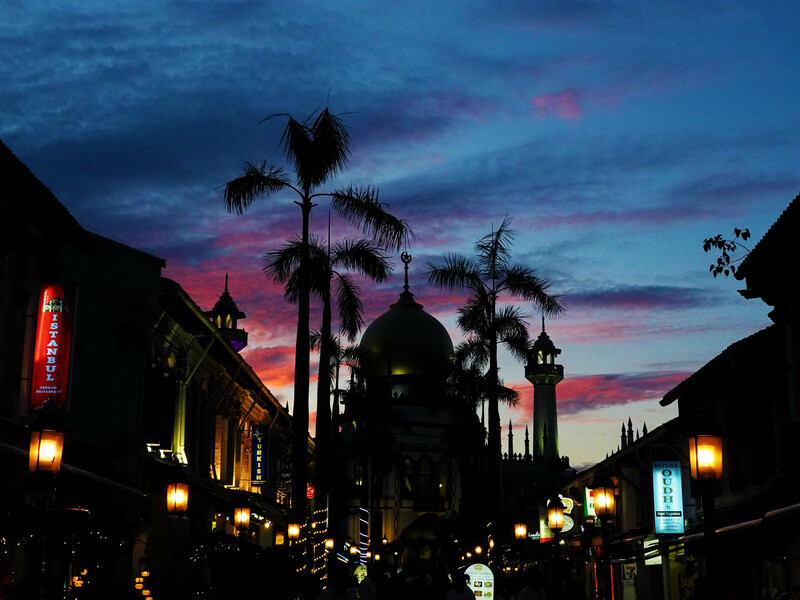 During the period of Ramadan, just past 7pm, a temporary lull settles over the community. Time halts as everyone settles down to eat and drink in the company of friends and family. A flurry of activity surrounds the food bazaar, with people queueing up to the fragrant aroma of delicious foods. And as I stroll through Bussorah Street taking in all these sights, eating my lavender-honey ice cream beneath the moonlight, I am overcome by an immeasurable sense of peace.